This easy to use unit makes heating and cooling your indoor areas a breeze. 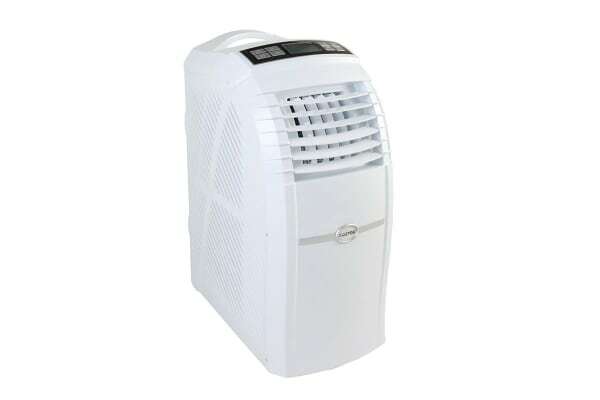 Small and lightweight, the Vostok 5.2kW Portable Air Conditioner (18,000 BTU, Reverse Cycle) pumps out an impressive 5.2kW of cooling power that’s easily transported from room to room as the temperature changes. Easy to set up at home with no need for expensive technicians, save on energy consumption with this environmentally friendly air conditioner. Simply set your desired temperature and the air conditioner will do the rest. For greater cooling and power efficiency, add water to the tray at the base which is then sprinkled onto the condenser, helping to cool the machine down without risk of damage. Water injection also makes the machine heavier to reduce the noise generated! A bit bulky and a bit noisy but pumps out a good air flow. Well made and suits my requirements. Needs to be ducted to outside as hot air blows from the back of unit which defeats the purpose of cooling a room.